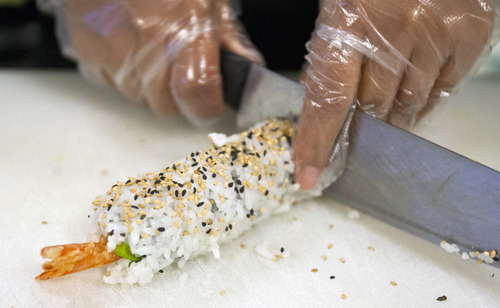 Global Kitchen Alliance readies newcomers for business, American-style. Chris Detrick | The Salt Lake Tribune Family Fresh Sushi owners Tial (Lucy) Philip and Dar Ki make sushi at the Horizonte Instruction and Training Center Friday November 30, 2012. Salt Lake County and the International Rescue Committee are starting up a program to teach refugees and others how to get into the food business. This can include making food for wholesale distribution or operating a restaurant. 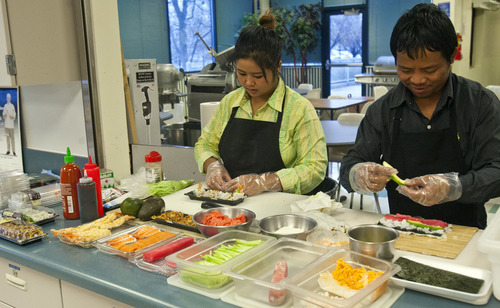 Chris Detrick | The Salt Lake Tribune Family Fresh Sushi owners Tial (Lucy) Philip and Dar Ki make sushi at the Horizonte Instruction and Training Center Friday November 30, 2012. Salt Lake County and the International Rescue Committee are starting up a program to teach refugees and others how to get into the food business. 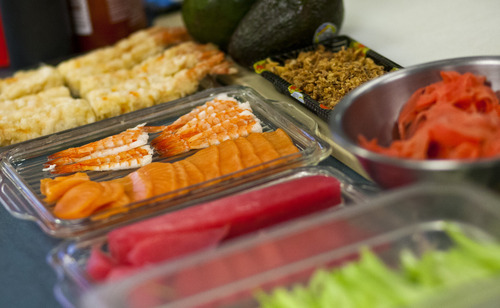 This can include making food for wholesale distribution or operating a restaurant. Chris Detrick | The Salt Lake Tribune Family Fresh Sushi owners Tial (Lucy) Philip and Dar Ki make sushi at the Horizonte Instruction and Training Center Friday November 30, 2012. Salt Lake County and the International Rescue Committee are starting up a program to teach refugees and others how to get into the food business. This can include making food for wholesale distribution or operating a restaurant. Chris Detrick | The Salt Lake Tribune Natalie El-Deiry helps teach Family Fresh Sushi owners Tial (Lucy) Philip and Dar Ki about the food business at the Horizonte Instruction and Training Center Friday November 30, 2012. Salt Lake County and the International Rescue Committee are starting up a program to teach refugees and others how to get into the food business. This can include making food for wholesale distribution or operating a restaurant. Chris Detrick | The Salt Lake Tribune Natalie El-Deiry helps teach Family Fresh Sushi owners Tial (Lucy) Philip and Dar Ki about the food business at the Horizonte Instruction and Training Center Friday November 30, 2012. Salt Lake County and the International Rescue Committee are starting up a program to teach refugees and others how to get into the food business. This can include making food for wholesale distribution or operating a restaurant. 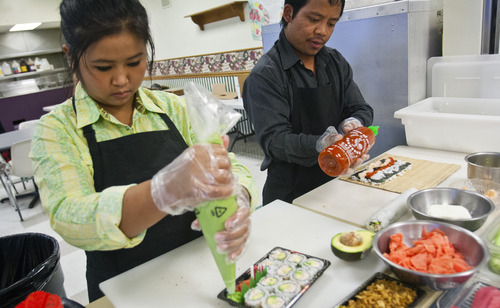 Chris Detrick | The Salt Lake Tribune Family Fresh Sushi owners Tial (Lucy) Philip and Dar Ki make sushi at the Horizonte Instruction and Training Center Friday November 30, 2012. Salt Lake County and the International Rescue Committee are starting up a program to teach refugees and others how to get into the food business. This can include making food for wholesale distribution or operating a restaurant. Chris Detrick | The Salt Lake Tribune Family Fresh Sushi owners Tial (Lucy) Philip and Dar Ki make sushi at the Horizonte Instruction and Training Center Friday November 30, 2012. Salt Lake County and the International Rescue Committee are starting up a program to teach refugees and others how to get into the food business. This can include making food for wholesale distribution or operating a restaurant. Chris Detrick | The Salt Lake Tribune Family Fresh Sushi owners Tial (Lucy) Philip and Dar Ki make sushi at the Horizonte Instruction and Training Center Friday November 30, 2012. Salt Lake County and the International Rescue Committee are starting up a program to teach refugees and others how to get into the food business. This can include making food for wholesale distribution or operating a restaurant. "Incubator kitchen" is not in Webster&apos;s Dictionary. But if it were, it might use words like "fantastic foreign food" to describe a program that seeks to teach refugees and others how to succeed in the restaurant business. Oh, and one more thing  it requires a commercial kitchen where trainees can hone their skills. Salt Lake City and The Leonardo museum are salivating to serve up such a facility for the program initiated by Salt Lake County Refugee Services and the International Rescue Committee. The City Council is considering funding construction of a commercial kitchen that would be built in the basement of The Leonardo, 209 E. 500 South. "The council is very enthusiastic about the program," said Councilman Kyle LaMalfa. "The opportunity at The Leonardo is timely and an efficient use of government money." LaMalfa imagines immigrants cooking up exotic dishes for one of the many festivals held at City Hall&apos;s Washington Square, across the street from The Leonardo. The council is considering a grant of between $155,000 to $250,000. That is scheduled to be approved Tuesday as part of a budget amendment. By itself, the city&apos;s grant would not cover all the costs of the incubator kitchen. But the program has other donors to help fund the enterprise that would cost about $300,000, according to program organizers. It would be the first museum/incubator-kitchen partnership in the country, said Leonardo spokeswoman Lisa Davis. The Leonardo, a private nonprofit corporation, always has sought to incorporate food as part of its cultural mission. "We think there would be a lot of synergies," Davis said. "For The Leonardo to be a public platform for people and culture  it&apos;s a win-win." 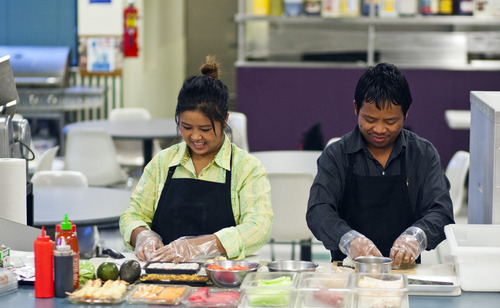 The Global Kitchen Alliance program, spearheaded by ZeMin Xiao and Natalie El-Deiry, is looking at several options for its commercial kitchen space. But Xiao, the county&apos;s refugee services liaison, said the city&apos;s proposal will get serious consideration. Refugees and other immigrants arrive in this country with a knowledge of recipes from around the world, she said. But while they may know how to cook, they are unaware of state and federal laws surrounding food handling, and likely know little about the complexities of running a business in this country. 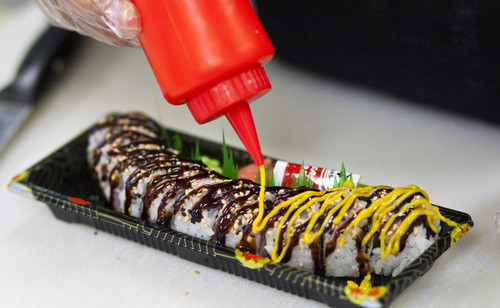 Although the food and restaurant business is one of the easiest to enter for immigrants, it also is one of the most difficult in which to succeed, Xiao said, noting that about 90 percent of new restaurants fail. The Global Kitchen Alliance program takes its clients through a variety of steps over months  or even years  to maximize the success of their endeavors. "It&apos;s a hands-on program," Xiao said. "Instead of people investing all their savings and jumping into something, this gives them trials so they can see if it&apos;s something they really want to do." Participants get a food handler&apos;s license, learn to prepare menus, and get instruction on marketing and cash flow-strategies, among other things, said El-Deiry of the International Rescue Committee. Would-be chefs start small by preparing food for festivals and The Downtown Farmers Market or packaging dishes for sale to local restaurants. The Global Kitchen Alliance has developed some curricula and is working on others, El-Deiry said. 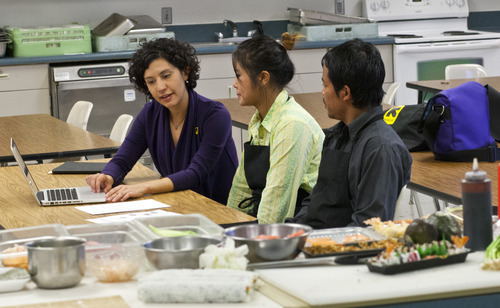 The program is being modeled after La Cocina, a successful incubator kitchen in San Francisco. La Cocina has been successful in helping many immigrants become restaurateurs and food wholesalers, Xiao noted. It also has been a boon to San Francisco&apos;s restaurant scene. "It&apos;s a great economic development tool for the city," she said. "The benefits are incredible."